The right chapter books for early readers can turn a reluctant reader into a voracious reader! 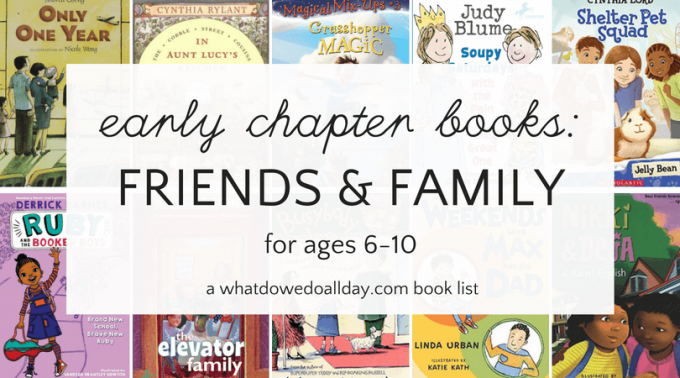 I love these books about friends and families; they are sweet and funny stories that are age appropriate for children who are early advanced readers and yet still interesting for more typically developing readers. Think: ages 6-10 (or as young as 4 or 5 if you have a super-advanced reader like I did!). These are perfect beginning chapter books for kindergarten and first grade shelves, as well as second and third graders. Kids will relate to the tales of friendship foibles and family squabbles and love. If you want a bit of extra help finding the right book for your child at the library, read my parent tips and hints for finding and choosing chapter books. And, don’t forget, I have many other beginning chapter book lists! 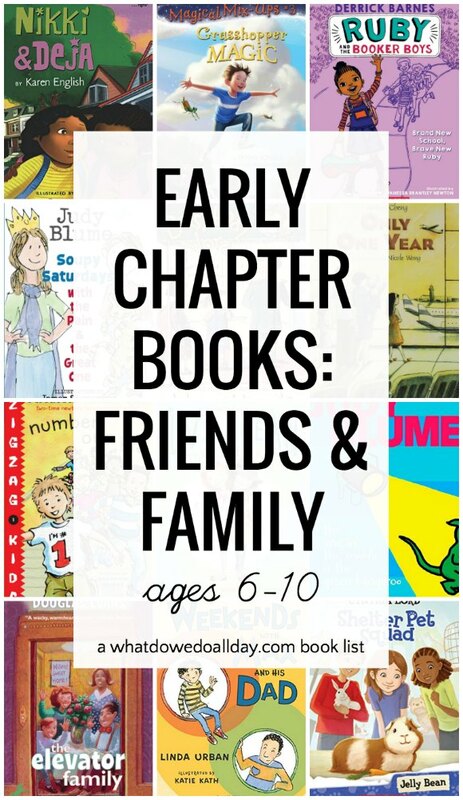 Find them all here –> early chapter books. Cobble Street Cousins by Cynthia Rylant. Three cousins live with their aunt while their professional dancer-parents (all 6 of them!) are touring the world. Lily, Tess and Rosie have lots of wholesome neighborhood adventures like baking and selling cookies and putting on theatricals. For parents who want to avoid sassy characters, this is a good series; lauded author Cynthia Rylant has a talent for writing stories which are simultaneously modern and old-fashioned. Ivy & Bean by Annie Barrows. This series has become wildly popular and probably needs no introduction. Two quirky girls let their imagination run wild in this stellar early chapter book series about friends. Sophie Blackall’s black and white illustrations are just as good as the writing. The One in the Middle is the Green Kangaroo. Judy Blume’s 1969 short chapter book is a classic and still a wonderful read. (It was also her first published book!) Middle kid Freddie wants to stand out from the pack and takes a chance in a school play. It all pans out and Freddie scores a win for middle children everywhere. Terrific. The Pain and the Great One by Judy Blume. The first book reads as a long picture book with a larger format, chapter divisions and full-color illustrations. That makes it a nice introduction and will entice kids to pick up the more traditional early chapter book installments which continue the adventures of brother (the Pain) and sister (the Great One). The stories are told in alternating views. As the sister of a younger brother I completely relate to these books and I appreciate that Blume paints a realistic picture of sibling life! Magical Mix Up series by Lynne Jonell. I read the second book, Grasshopper Magic out loud to my then-6 year old, and he quite liked it and asked for more. There was is quite a bit of age appropriate humor and it’s a very friendly sort of book series. In each book four siblings encounter a bit of magic, whose source is beneath their lawn and they rally around each other to undo the magical mix up. Weekends with Max and His Dad by Linda Urban. This is a lovely book about a boy who enjoys spending time with his dad. While not heavy headed, it is clear that Max’s parents are separated and readers follow Max as he begins to learn that his dad’s home is his home, too. Book Uncle and Me by Uma Krishnaswami, illustrated by Julianna Swaney. The Book Uncle is a friendly gentlemen who helps children in India find just the right book at the street corner lending library he runs. This is a terrific story about one girl’s determination to stand up and protest corrupt politicians who threaten to put Book Uncle out of business. Yasmin’s story will inspire your kids to work towards a goal and learn about the value of community involvement. Only One Year by Andrea Cheng. Sharon’s baby brother DiDi is being sent to China to live with their grandparents for a year, while their mother goes back to work. Over the year, Sharon and her sister, Mary keep up with DiDi through photographs until he returns. A lovely, gentle story that will give kids a new look at family life. Gone Fishing, and Gone Camping by Tamera Will Wissinger. I adore these two books, written in verse, about families spending time together. In the first, Sam and his father head out to fish when his sister, Lucy, tags along. In Gone Camping, Lucy camps with her Sam and grandfather. The books are easy to read and cover a variety of poetic forms. Wonderfully unique and a great way to get kids to read poetry. Ruby and the Booker Boys (series) by Derrick Barnes. Ruby is 8 and has three popular older brothers. But the cheerful, upbeat Ruby is determined to hold her own in this sweet early chapter book series about a loving, if mischievous family. Shelter Pet Squad (series)by Cynthia Lord. Suzannah is not allowed to have a pet in her apartment, so she decides to volunteer at the local pet shelter. Suzannah and her friends work together to take care of the animals. I love the way the books also include facts about the animals as well as crafts! Zigzag Kids by Patricia Reilly Giff. Ranging from kindergarten to 6th grade, a diverse group of kids come together for an after school program where they engage in fun learning experiences. Each early chapter book about friends focuses on a different kid and his or her challenges and triumphs. In addition to Zigzag Kids, prolific and award winning author Patricia Reilly Giff also wrote the extensive The Kids of the Polk Street School, the The New Kids of Polk Street School, and the Polk Street Mysteries! I like these books because although the characters learn realistic life lessons about things like how to be a good friend and student, the stories do not come off as preachy. Double Trouble by Abby Klein. This series, chronicling the adventures of twins Kelly and Kasey, is a spin-off of the popular Ready, Freddy! books. Twins are not as rare as they used to be, and the comedy will appeal to a lot of young readers. The books end with an activity page. The Elevator Family by Douglas Evans. This is a funny trio of books about a kooky family who takes up residence in the elevator of a hotel building. A bit odd, yes, but their cheerful dispositions and unfailing kindness are contagious to everyone they meet. Riverside Kids by Johanna Hurwitz is one of my favorite series. Set in an apartment building in New York City’s Upper West Side, groups of siblings live in neighboring apartments. The two main families consist of Nora and her brother Teddy, and Russell and his sister Elisa. The children have lovely big city adventures and, unlike in many series, the kids age up as the series continues. As far as I can tell, Busybody Nora is the only one still in print but I’m delighted to see that many of the books are available as Kindle versions. And of course, check your local library. Beans on the Roof. Newbery author, Byars wrote this cheerful book about a group of siblings and their parents who write poetry on the roof of their apartment building. (How many families can you say that about?) I really enjoyed the loving relationship between parents and children as George struggles with writer’s block and Anna suffers a disappointment. Wow! What a fantastic list! All of my favorites and some new ones too- can’t wait to head to library to check out some I don’t know yet like The Elevator Family and Mimi and Sophie. I am also thrilled to hear your thoughts about more of these books appearing in digital format. As much as I love ‘real’ paper books, I know that there are many, many kids who prefer reading on Kindles and I love the fact that there are more quality books appearing in that format each day. Thanks for your comment, Stacey. We don’t have a kindle yet. My son isn’t a reluctant reader but I would get one in a second if I thought it would help him read more. I think my favorite thing about the digital format is that it is encouraging publishers to “re-release” books in an e-format. I can’t tell you how happy I was to see The Riverside Kids in e-versions. That series is so wonderful and if it takes an e-reader to convince publishers to make it available than that is a really good thing. Great list as always! We LOVE The Riverside Kids (our library still has a bunch of the out-of-print ones) and Mimmy and Sophie, which we learned about from you. My daughter loves Ivy and Bean and Nikki and Deja. I didn’t realize the Elevator Family was a series – she loved the first one. The Pain and the Great one series is good but not, ironically, great, in my opinion, although I love the picture book that started it all. Zigzag Kids and Cobble Street Cousins don’t quite do it for me, although my daughter’s been bringing home a lot of CSC books from school. I didn’t realize the Elevator Family was a series when I picked up the first book, either. And it’s so strange that the cover art is so different! The thing I like most about The Pain and The Great one is the alternating viewpoints, which is rare in this type of book. These look great – my older boy loves books about kids at school so I think the Appleville series will be just his thing. BTW I think my kids must be the only ones in the world who don’t like the Magic Treehouse series. I’ve tried it several times – even as an audiobook – and they just aren’t interested. I was hoping they would go for it as the idea of them having 50 books to get through before I have to find some new ones was definitely appealing! Depending on your son’s age Appleville might be too easy, but the Zigzag kids and Polk Street series are also set in schools so those might be good choices. Has he ever read the Wayside School series? Maybe those are still too advanced for him, but they would make really great read alouds since from your previous comments I take it he likes silly stuff. Yup – the sillier the better! He’s 6 but not a very advanced reader (although very keen) so I don’t think the Appleville series will be too easy. He’s reading the Roscoe Riley books at the moment (another one of your recommendations!) and he can just manage them. He hasn’t read any of the other ones you recommend so I will get them for him – I still do lots of reading aloud to him so if they are too advanced it won’t matter. It sounds like Appleville will work well for him. Be sure to tell me if he likes it! I always wonder if people try out and enjoy the books I share. The Weird School books are also good – funny, silly, short, although maybe a little hard for him. And my daughter won’t even pick up a Magic Treehouse book, which is fine with me. Thanks, Jenny. Sometimes I’m the only mom who has to say “put that book down so we can go!” He never wants to put a book down until he has read the whole thing. I’m so glad to see so many older books being released now in Kindle versions! Thanks for the list, my kids aren’t reading yet, but I know that we will be visiting it again once they are. I love the theme too! I really liked Riverside Kids too. We read some of the series on this list, and now I loaded up on your earlier recommendations and can’t wait to see which ones Anna likes best. I feel really old. How have some favorite authors had time to write entirely new series?!? Love this list!